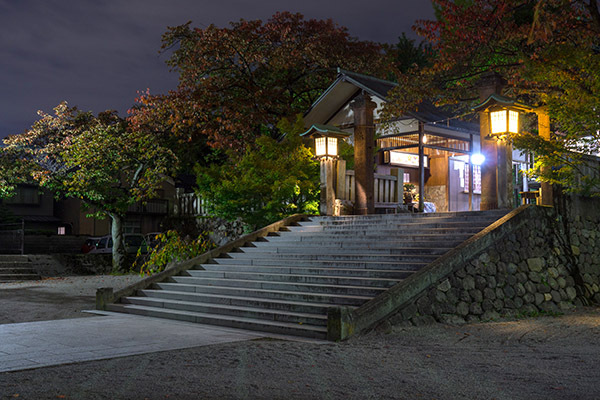 In December, I made a post about my October trip to Japan with about a dozen images. There was a lot of interesting and positive feedback asking to see more. In this post, there are some images from Takayama, Hiroshima, and Kyoto, the former Imperial Capital of Japan. 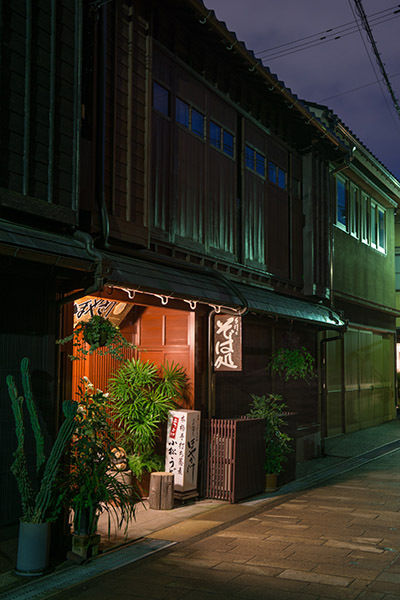 The traditional, ancient buildings in the Gion, the Geisha District of Kyoto, was a wonderful place to wander around at night. It was surprisingly quiet, considering at one time this was the happening nighttime place several centuries ago. I did not have my tripod with me, so I had to make due with my little table-top tripod for these shots. That limited me on my vantage points, using trees, fences, buildings and even cars on which to prop my six inch tripod. There are some sumptuous tones in the shadows in this image. That is one of the pluses of modern digital cameras. 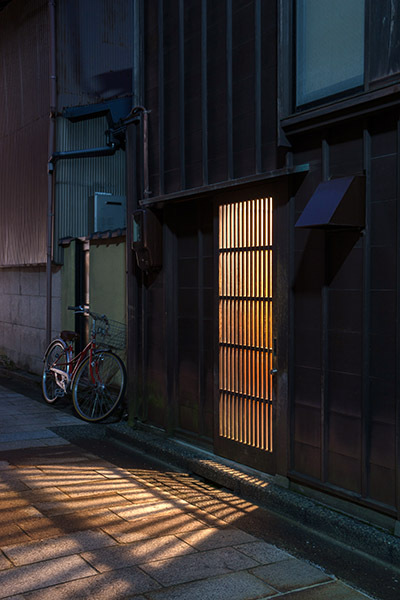 It was the light reflected off this bicycle in an alley in the Gion that caught my attention. The lighting coming out of the entryway added a warmth to the cool blue of the evening. I shot several variations of this, using a telephone pole to steady the camera. 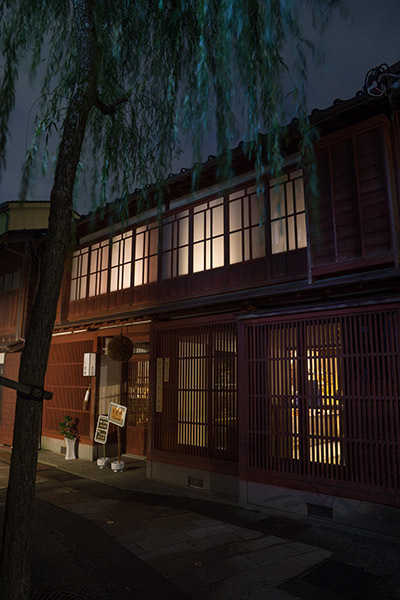 Below is a tea-house in the Gion. It gave some light to the otherwise darkness. Yes, it was still open, and I was temped to go in as it looked inviting. 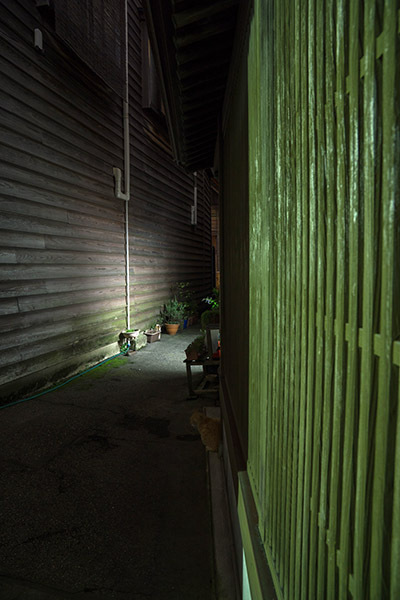 There was these interesting clapboard siding with strips on many of the houses in the Gion area. This image was lit from a couple of distant street lamps. The texture of the wood and traditional Japanese roof tiles intrigued me. It was quite dark in this area and I put the mini tripod and camera on a railing, cropping out a car just below the image to retain the historical flavor. This is a kitchen light spilling out into a back alley. This, mixed with the green mercury vapor lamp on the fence from a light a the end of the street gave a nice mix of color. I’m sure this image during the day would not be worth shooting… but at night it’s a different story! There are nearly 2000 temples in Kyoto alone. We visited a number of them. This one in the Gion was open and unattended. Trying to get this shot without a regular tripod was a challenge. That bright lamp coming from within could not be blocked, because I used my mini tripod/camera against an immovable flag pole. I wished it was a foot to the right, as it would have blocked the lamp with the support column. You can see the importance of camera placement, especially at night. 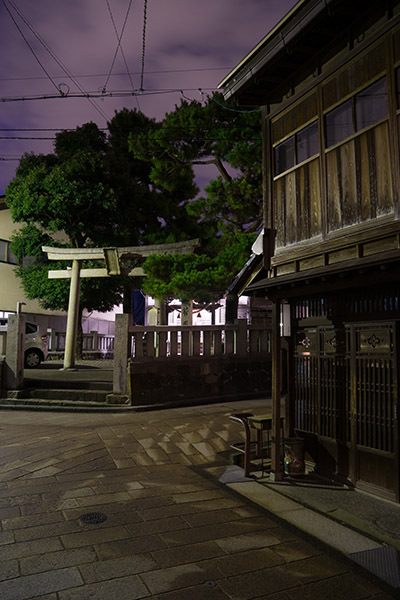 Still, I like this image that shows traditional Japan that few tourists see, especially at night. 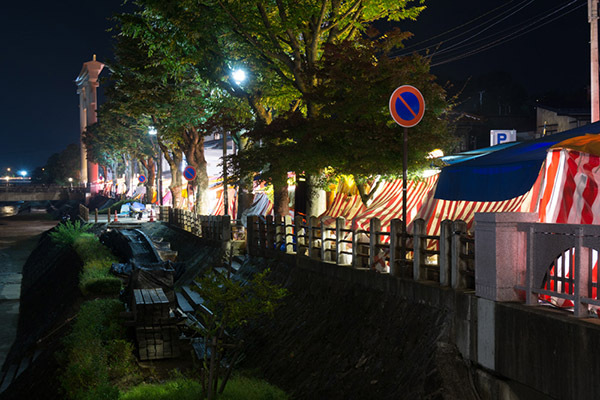 Here is an image in Takayama during the Autumnal Fair. This is the back of the street vendors, with the river on the left. It was the back light through the tents that interested me. That is a giant torii on the left. I took several night shots in this area, this being the last one. With 40% showing left on the battery, it decided to die prematurely, and I had no spare with me at the time. This is why you always need extra batteries in our modern digital age! I retired that battery on the trip. One of the important cities to visit in Japan is Hiroshima. 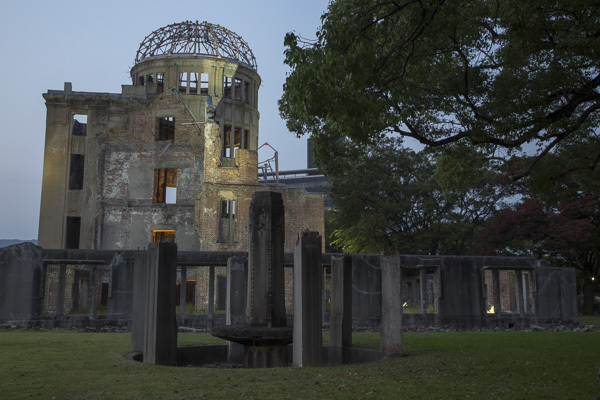 The violent history of WWII is remembered here, with numerous shrines, memorials, and museums. 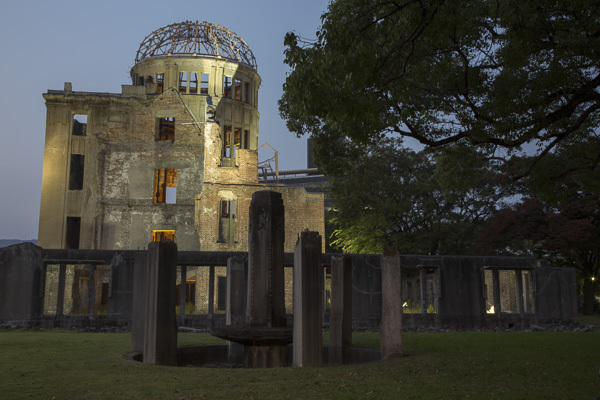 The most recognized is the “Atomic Dome”, which was an Industrial Exhibit Hall prior to the blast in August 1945. It survived mainly because it was almost directly beneath the blast which occurred 2000 feet above it. The downward force didn’t knock the brick walls down. Everyone in the building was killed instantly in the blast. From a photographic standpoint I felt I needed to feel the presence of the place to shoot it effectively. I walked around photographing for over an hour alone in the late afternoon, exploring the different angles. I then knew what angles I wanted to shoot at twilight. It was an overcast evening. The next three establishing shots were all done on a tripod within 17 minutes, as the light changed. Note how the artificial lights have come on as night approaches. They used reddish sodium vapor lamps in the lower floors and more neutral high discharge lamps on the structure itself which really works. In the foreground was a fountain. I worked intensely over the next 20 minutes getting the shots I scouted earlier. The bright colors against the stark gray building and mysterious shadowing gives this image drama as if it was staged. 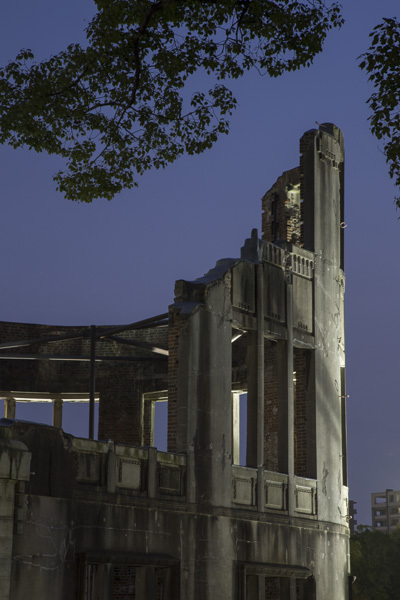 Of all the shots I did at twilight, I think this is my favorite, as it appears to be a monolith–a survivor 70 years later. It’s an unusual view of this widely photographed icon. Several people who watched me shoot came in with their cell phones to try the same view. Of the literally hundreds of people taking photos only one other person had a tripod, a British tourist. That’s why it’s worth carrying one–to get the shot few others can. WOW tom, looks like you had a great time! Oops, cleaver-clever please pardon my spelling! I don’t think there’s a lock on the bicycle in the alley in 祇園. Did you notice that? Would love to see the high-res. These are ALL stunning. What an eye you have! I like seeing what you photograph. Clearly your ingenuity placing the tripod made a big difference in many of these shots. Well done, creative Tom! Very nice, Tom! Thanks for sharing! The night trawler Tom! Or the revenge of the tripod! The last twilight shot of the Atomic Dome is eerily fascinating, with walls almost metal, as in heavy metal, as in “full metal jacket”. Really evocative images, I especially love the mix of color temperatures. Beautiful work. Like to see a print portfolio of these or a small sized book. The last one’s the money shot. Very atmospheric set of pics! Awesome images! You definitely captured the essence of Japan! Kudos! My book will be out soon. I have a 4×5 shot coming up, I am looking for a second opportunity in the same are so I can get two good shots for my future project. I enjoyed your images of Japan. The last shot of the “The Atomic Dome” series and the bike in Gion are my favorite. Lovely photographs, as usual, Tom. How clean and orderly everything looks! No debris, buildings in good repair, it all looks inviting to a pedestrian. All your locations look like interesting places to visit. 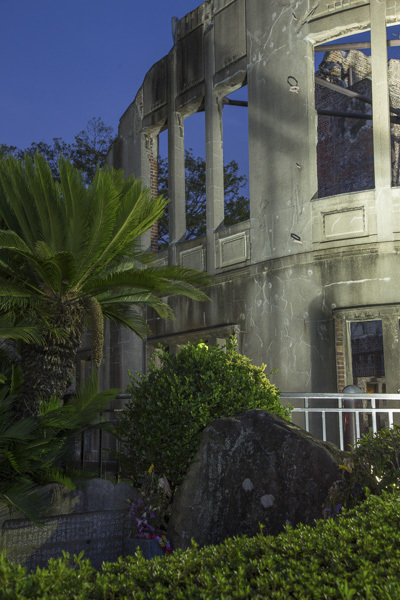 Especially the Hiroshima Memorial building. I can only imagine the solemn feelings it generates in person. 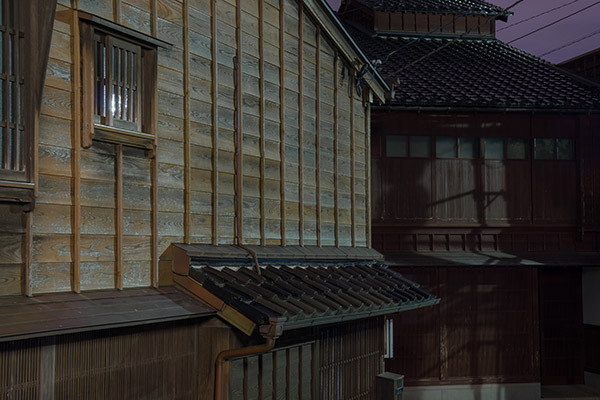 Wow, I really like the set of Gion images. Love the atmosphere and mood that they give… These are very “frameable”. Worthy of a show, I’d say.